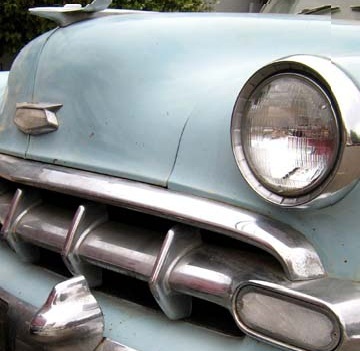 It wasn't the powder-blue '53 Chevy -- that smelled like jute, rubber and buttermilk. It was the safety that I kept in my heart knowing that the buttermilk smell was there because my grandmother spilled a milkshake inside the car and it was knowing that my mom would take us to the Allen pool in that smelly old thing. So it wasn't the car at all. It's just sometimes I forget that the most precious things aren't really tangible. My grandmother is long-gone and so is the Chevy. Yet still, I find myself at times, anguishing over tossing an old worn-out and unwearable tee-shirt simply because of the memories I attach to it. But really, everything I need to sustain those thoughts are forever safe within the walls of my chest.